Huai Ma Now Reservoir Located in Ban Mai Sawan, Mae Wang district, Chiang Mai. It is a royal construction project in His Majesty King Bhumibol Adulyadej. This area was originally a degraded forest area to be allocated to cultivate about 4,500 rai. Huai Ma Now Reservoir can send water to the plantation area in the rainy season is about 4,500 rai and planted in the drought season is about 2,000 rai. 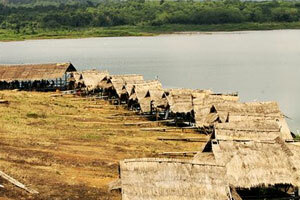 It is also a important freshwater fish breeding ground in Mae Wang District. This is the source of many kinds of fish. There are people who like to fish around the reservoir. Food and drink at Huay Lemay There are many choices for tourists. The dining room seating arrangement is constructed as a floating raft. And it is on land to choose too. Price compared to the taste and type of food is not expensive at all. Travel By car Starting from Chiang Mai to the south. Take Highway 108 (Chiang Mai - Hod), about 19 km to San Pa Tong. To see the three junction on the right is a signpost to Mae Wang district. The Highway No. 1013 go straight for about 12 km to Ban Card, Mae Wang. When you find three intersections and then turn right. Approximately 7 km, it will reach the reservoir Huai Ma Now. This road is comfortable because there is not much car and traffic like other routes.